Supplier Management starts with cultivating a relationship with your suppliers that will strengthen both businesses and create mutual profits. In 1 minute, here are 5 keys to consider for creating a prosperous business relationship between you and your suppliers. A solid foundation of trust established through an environment of open communication is the cornerstone of a good vendor relationship. Frankness and transparency are paramount to creating a successful working relationship, so make a point to convey to your supplier that they can communicate openly about any issues or concerns they may have. Hint: It's harder than it sounds. Utilizing should cost techniques can help tremendously by removing the adversarial relationship on material cost. Short-term gains shouldn’t be favored over creating a lasting partnership with your supplier. Promoting a partnership is a sure strategy that can prove equally beneficial, and a partnership with a trusted supplier will outperform any small savings you may receive from switching suppliers over small fluctuations in price. On the other side, a trusted supplier should pass on favorable PPV, not use PPV as a profit center. Proper supplier management involves generating a structured understanding between you and your vendor in which both parties can thrive. Strong-armed negotiation tactics only lead to distrust, so all negotiations between you and your vendor should be fair and honest, making certain that neither party gets the short end of the deal. Don't forget to consider the intangibles of trust. Contract manufacturers make critical decisions about supporting your requirements based largely in the trust they have in you. 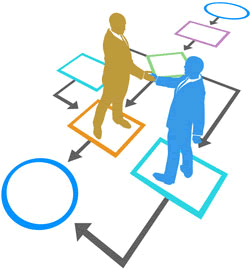 Speaking of structure, documented supplier agreements keep both parties honest and guarantees understanding. The agreement should address key expectations such as pricing, expected volume, delivery dates, terms, and a return policy. Thorough record keeping of your vendor agreement encourages transparency between you and your vendor, and promotes a symbiotic relationship in which both parties can reap the benefits. It doesn't have to be fancy, some of the best agreements are just 1 or 2 pages. While it’s important to create a strong positive bond with your supplier, it's equally important to ensure that the service and materials you receive meet the highest quality standards. A periodic vendor performance review that evaluates on-time delivery rates, defective part rates, and quality of customer service among other factors should be assessed regularly. 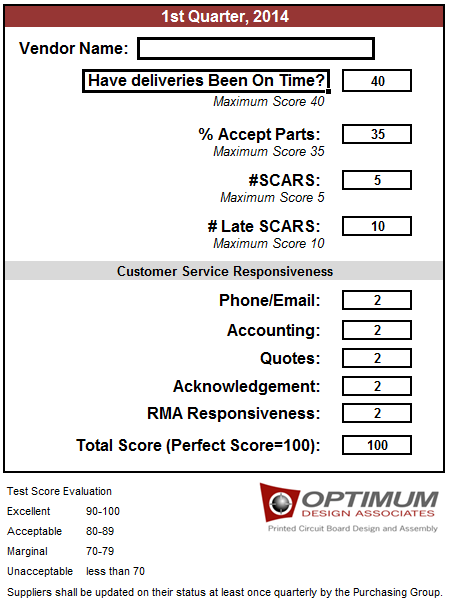 Below is an example of a supplier scorecard which looks at these and other areas of performance, and grades the supplier on a one-hundred point scale. Your 1 Minute is Up! Through team work and careful evaluation of your suppliers, you can create a prosperous business relationship allowing both parties to thrive, while also promoting transparency and honesty. ©2019 OPTIMUM DESIGN ASSOCIATES. ALL RIGHTS RESERVED.